If you suffer from acid reflux or gastroesophageal reflux disease (GERD), which is a more severe form of acid reflux, then you may feel some relief by sleeping with your bed raised. The National Sleep Foundation reports one of the leading causes of sleep disturbance for people between 45 and 64 years old is heartburn or acid reflux. Acid reflux can cause you to wake up coughing or choking because the acid in the stomach backflows into the esophagus especially when you are lying on a flat surface. To reduce your acid reflux symptoms while you sleep, here are a few suggestions to keep in mind. Eating smaller meals more frequently will reduce the amount of food the stomach needs to digest at once so the stomach will produce less acid. Avoid eating certain foods that have been shown to cause acid reflux, such as soda, coffee, alcohol, fatty or spicy foods, and the one no one wants to hear, chocolate. If you avoid late night snacking, it will help your stomach be empty and reduce the amount of acid that is produced to digest food. Waiting three to four hours before lying down will also decrease the amount of food and acid in the stomach. A sleep wedge may help, but this can cause back or neck pain if you are not sleeping on it correctly or if the wedge is not the proper size for your body. Raising your bed four to eight inches at the top end is thought to be the best solution. 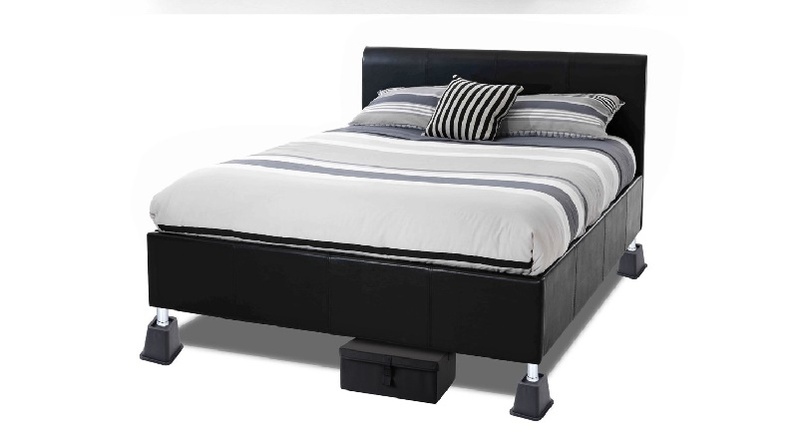 An inclined bed will increase your circulation throughout your body all night. This improved circulation will help you sleep more comfortably, decrease the likelihood of acid reflux or GERD, and you will wake feeling more rested. A raised bed will help keep your stomach acid in the stomach where it belongs instead of rising into the esophagus causing burning and pain. The stomach acid is powerful to help break down the food you eat so it can move into the intestines for digestion. If the stomach acid continues to travel into the esophagus repeatedly, over time it will begin to erode and damage the lining of the esophagus. It can cause inflammation in the esophagus that causes a feeling of a lump or make it difficult to swallow. Stomach acid causes ulcers to form in the lining of the esophagus, which will heal and then become damaged again. Over time, these will turn into scar tissue called strictures, and strictures do just that, it restricts your ability to swallow or breathe if they become severe enough. Below we share the best bed risers for acid reflux so that you can get some relief when you sleep. Suffering from acid reflux can cause you not to want to do the things you once enjoyed or eat the foods you enjoy. Some remedies can help reduce acid reflux from happening, but when it happens, you want to be prepared. One way to keep yourself prepared is by sleeping on a raised bed. Those four to eight inches can make all the difference if you experience acid reflux or GERD while you are trying to sleep. The other health benefits of sleeping on a raised bed are nothing to ignore. Improving your body’s circulation while you sleep will help improve the body’s ability to heal. A raised bed will decrease snoring or sleep apnea for some people. Improved sleep helps everyone to feel better and more energetic in their life. Try raising your bed with blocks or risers four to eight inches to create an incline and see if you sleep better and have less acid reflux during the night. Raising your bed along with the other suggestions of eating lighter meals, avoiding certain foods, and waiting to lie down until your food is partially digested can reduce your acid reflux or even help it to stop.